Have you ever thought much about how you really cook? I mean when you’re cooking regular, daily meals not when you’re following a specific recipe to try something new or when you’re making something for a special occasion. For day-to-day cooking, do you always make your favorite meals the exact same way every time? Probably not. The new book from Deborah Madison, In My Kitchen: A Collection of New and Favorite Vegetarian Recipes , is a look at how she really cooks. These are recipes that may have appeared in a slightly different version in previous books, and they are ones that she turns to often. Here, she explains why they have stood the test of time for her and how she has modified them since they were first written or routinely changes them up depending on what’s in season. There’s a nice introduction to how her cooking has changed now that so many well-made food products can be easily found in markets. She also writes about her garden and the delight of planting and growing new and different things to use in your cooking. What I really enjoyed about this book was that in the head notes for the recipes there are several suggestions for ways to vary ingredients or technique along with ideas for what to serve with the dish. Those notes give you a real sense of her regular cooking and inspire you to experiment as well. For several recipes, you’ll see that she has simplified the process from the original version. The Warm Cabbage Salad with Togarashi Tofu Crisps is a more streamlined approach to a similar dish from her book This Can’t Be Tofu in which the crisp tofu cubes are treated like croutons. The Eggplant Gratin with a Golden Dome of Saffton-Ricotta Custard is lightened up compared to the original now that the layer of cheese has been removed. And, the Masa Crepes with Chard, Black Beans, Avocado, and Pickled Onions began as a rich, layered Mexican casserole. I can’t wait to play around with the recipe for Yellow Coconut Rice with Scallions and Black Sesame Seeds. It’s intended to be pressed into a pan, chilled, and then cut into diamonds and browned. It could also be served warm from the stovetop after initially cooking, and there are some great suggestions for what to serve with it. 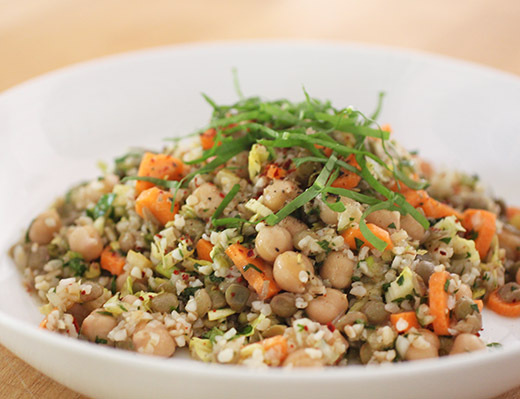 The first dish I tried from the book was the Bulgur and Green Lentil Salad with Chickpeas and Preserved Lemon. I had some pretty, bright carrots from my CSA and some locally made preserved Meyer lemons that were perfect for this recipe. And, I learned something new. Every time I had ever used bulgur in the past, I poured boiling water over it to soak before using. Until reading this recipe, I didn’t realize you could just pour cool water over it and wait about 30 minutes. It becomes tender, and you can drain away any excess water. I actually had some cooked green lentils in the freezer and got to skip that cooking step in the process. The dressing was a quick mix of minced garlic, lemon juice, olive oil, sliced scallions, and salt. 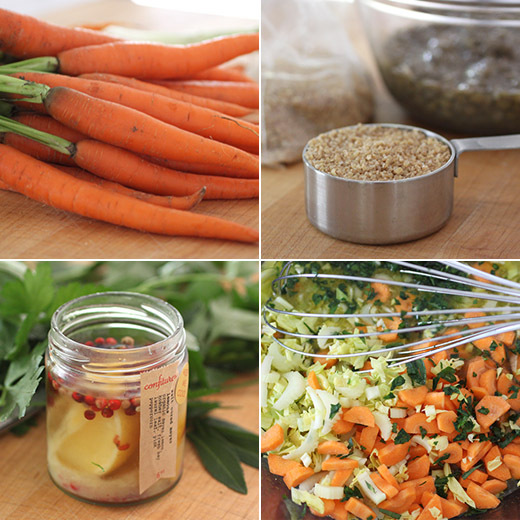 The preserved lemon was chopped as were the carrots, celery, and herbs. Fortunately, I had some parsley in my herb garden, and I used my Mexican mint marigold rather than tarragon. 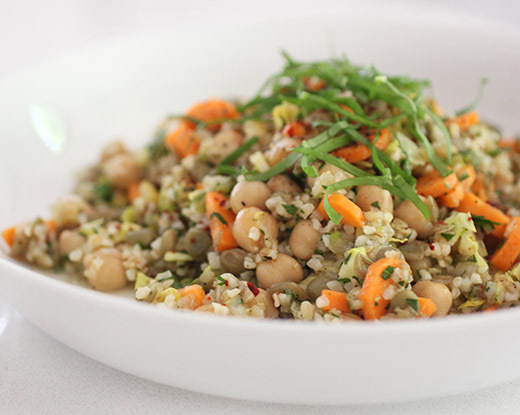 Rinsed and drained chickpeas were combined with the vegetables, herbs, bulgur, and lentils, and the dressing was added to finish the dish. I’ve read and used several Deborah Madison books, and it was fun to see some recipes I recognized from earlier works here. It was her books that got me interested in using sorrel, and now I love finding it at local farm stands in the spring. I had just bought a bunch of sorrel the day I made this and decided to chiffonade a few leaves for a garnish on top of the salad. The lemony ribbons were great with the bright dressing and bits of preserved lemon throughout. This is the kind of book I want to keep flipping back through to remind myself of all the great tips. And, I want to keep cooking these dishes. Recipe reprinted with publisher’s permission from In My Kitchen: A Collection of New and Favorite Vegetarian Recipes . If you have time, soak the lentils in water to cover for 30 to 60 minutes. Drain the lentils, then put them in a small saucepan and cover with water by at least 2 inches. Add the bay leaf, carrot, and 1⁄2 teaspoon of salt, and bring to a boil. Reduce the heat to medium-low and simmer until tender-firm, 25 minutes or longer. Meanwhile, put the bulgur in a small bowl, add 2 cups of water, and let stand until the liquid is absorbed and the grains are tender, about 30 minutes. When a grain tastes done, drain the bulgur and press out any excess water. Whisk the garlic, lemon juice, oil, scallions, and 1/2 teaspoon of salt in a large bowl. When the lentils are done, drain them and add them to the bowl along with the bulgur and chickpeas, preserved lemon, parsley, tarragon, and celery stalks and leaves. Turn gently and thoroughly. Taste for salt and season with pepper. Mound the finished salad into a handsome serving dish. Serve immediately or cover and set aside to serve later. Love Deborah Madison! This is one cookbook I will read. Your dish looks marvelous, every ingredient is on my favorite list. So nice to have another delish vegetarian dish. Thanks for your sweet comment...will keep an eye on you re Facebook and Instagram...you are a favorite! Very mouthwatering! A lovely combination of flavours. The salad looks wholesome! Have never tried preserved lemon in salads...now I am really intrigued. Funny you mentioning sorrel. I've been cooking and eating sorrel lately and really enjoy it! What a lovely salad. I still have Deborah Madison's first cookbook, but had no idea she was still publishing! i'm pretty into bulgur these days, and i do definitely have staple recipes that i like to tweak from week to week! sounds like a very useful cookbook, and this is a great dish! I'll bet about a third of our meals are either salads (at this time of the year) or soups (during the cold months). Never made exactly the same way twice, but the basic template remains similar. Anyway, love salads like this -- so full of flavor and goodness. Thanks! What a delicious-looking salad! I've never cooked from a Deborah Madison cookbook, so I'll have to check her out.